The Jets were given a Bronx cheer by the replay officials in New York just across the river and it played a key point why the Jets weren’t going to overtime. But in the end, the Patriots were able to hold on again 24-17 as Tom Brady became the NFL’s all-time winningest quarterback in regular season history with his 187th win breaking a tie with Brett Favre and Peyton Manning. He’s already the NFL’s all-time leader in wins with both regular season and playoffs combined. But back to the controversy. Austin Seferian-Jenkins caught a pass at the four-yard line and rolled to the end zone, where just at the pylon, Malcolm Butler tried to and for the briefest of moments jarred the ball free. But Jenkins never really lost control and rolled out of bounds in the end zone in what appeared to 77,562 people in the stands and thousands on television as a touchdown. But NY overturned the call on the field and ruled it a touchback and New England’s ball on the twenty. A huge gift and swing of momentum. And before my timeline fills up with Patriots Nation telling me it was the right call, switch the teams around and picture Rob Gronkowski rumbling to the end zone and the same play happens….is it a fumble then? It was the worst call in a generally terribly officiated game. The Patriots were gashed on defense and turned the ball over on offense and it was 14-0 Jets before the Pats finally decided to kick it in gear. The lights then came on for Belichick’s crew and they rallied for 24 straight points and seemed poised for taking total control of the game over. But some sloppy play and indifferent defensive play struck again and the team had to hold on for another seat-of-your-pants type of win. The Patriots recovered from a bad sequence at the end of the half to get a turnover and then went down the field in just 26 seconds to score a game-tying touchdown on a pass from Tom Brady to Rob Gronkowski. Gronk who was interfered with horribly on an earlier non-call where Stephen Gostkowski missed a 47-yard field goal when it seemed the team would go into the half trailing 14-7 or worse. The Jets were moving but McCown made a mistake when he got greedy. He made a bad decision to throw on the sideline where Malcolm Butler was in great position to jump the route and he did intercepting the ball. Brady then hit a beautiful rainbow play to Brandin Cooks to set the Patriots up at the two where Gronkowski outmuscled rookie Jamal Adams for the tying score. Receiving the ball for the second half kickoff, Brady marched them down the field where Gronkowski scored his second touchdown of the game getting behind the secondary for a 33-yard touchdown and suddenly New England is up 21-14. It was their best sequence of the day and at that time, they looked poised to put the Jets far in the rear-view mirror. But it was not to be and the team allowed McCown, to march up and down the field in the fourth quarter like they were facing Aaron Rodgers or Matt Ryan, who coincidentally comes to Foxboro next week. 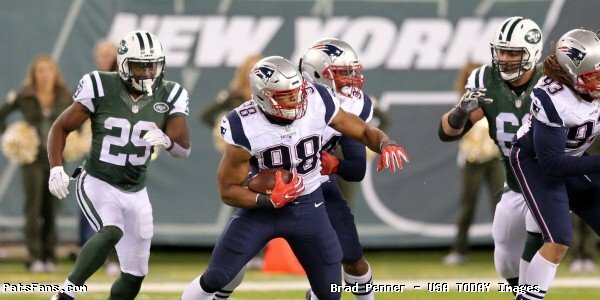 The Patriots Run Defense was actually quite good today, holding the Jets to 74 yards overall and Jets running backs were held to 20 carries for 47 yards. Alan Branch seemed like the Alan Branch of old and was doing a great job of stuffing the interior. Malcom Brown had two run stuffs for negative yardage. The Pass Rush isn’t getting it done. Can’t blame Matt Patricia for being too conservative in this one. The Patriots rushed five many times and used the corner blitz often in an attempt to influence the play. It didn’t do it enough. Often McCown had tons of time and of the four sacks, the Patriots got, thank the coverage on most of those. Brady was noticeably off with his accuracy for much of the day. He completed only 20-38 for 257 yards with two touchdowns and an interception. He threw deep into double coverage a couple of times and the second time was picked off by Buster Skrine. But in the middle of the game when the team found their rhythm, he was hitting some big third and long completions. His deep ball to Cooks was his best throw by far, 42 yards which set up the tying touchdown, right in the bucket. Cooks and Gronkowski had very productive days, Cooks caught 6 passes for 93 yards and Gronk had six for 83 with a pair of touchdowns. 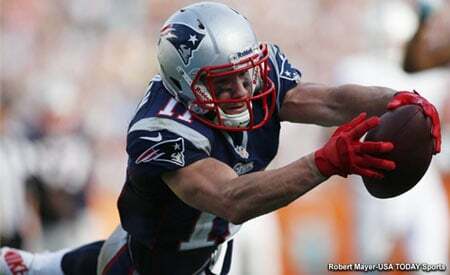 But Chris Hogan had a quiet day, catching just one pass for 19. Danny Amendola and James White also had only so-so production with 3 catches for 40, and 4 for 22 respectively. Kyle Van Noy had a productive day with a pair of sacks, and three quarterback hits and seven tackles. Dont’a Hightower and Malcom Brown were credited with the other sacks. 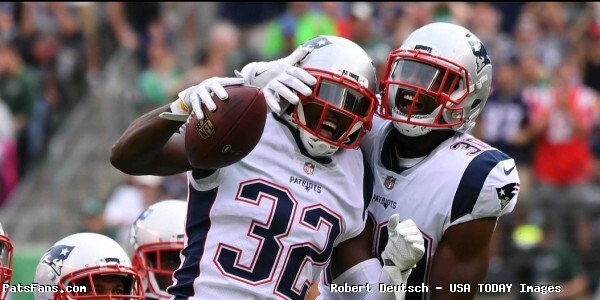 Dion Lewis had another good day running the football, with 11 carries for 52 yards and a touchdown. He had a long run of just 11 but once again, he appeared close on a few occasions of breaking on. Mike Gillislee had a costly fumble but also ran well, gaining 44 yards on ten carries. Josh McDaniels had an up and down afternoon. The Patriots didn’t get anything going until the second quarter. And he got too impatient before the half where with a minute and a half to go, the Patriots were on the Jets 30 and tried the deep ball twice in a row without success where Gostkowski missed a field goal. In the fourth quarter facing a 2nd and 5 from the Jets 6, he called a crossing route where a run would have had a much greater chance of success. With both Stephon Gilmore and Eric Rowe out, Johnson Bademosi got the start with Jonathan Jones in the slot. Surprisingly, the Jets went after Malcolm Butler and not Bademosi. He didn’t play badly but played as better than what can be expected. However, the overall pass defense once again was very leaky. There were positives to report, such as the Patriots not panicking once they got down by 14 points. They raised their level of play on both sides of the ball and showed a ton of resiliency against a division opponent on the road in a loud stadium. On a day where they weren’t playing their best. They rebounded and climbed out of a big deficit. While they didn’t start or end the game particularly well, the Patriots showed the mental toughness that champions must have. But there is no sugar-coating the play of the defense where although they ‘officially’ allowed only 17 points, their level of play early and late in the game just isn’t going to get it done. And now Matt Ryan and the Falcons are coming to town next week, fresh off of blowing a seventeen point lead at home against the Dolphins. One other footnote for the game is to call attention to all of the people who constantly rail about the Patriots making the playoffs because of how weak the AFC East is. Well the AFC “Least” has more wins in Atlanta this season, than the Falcons do. 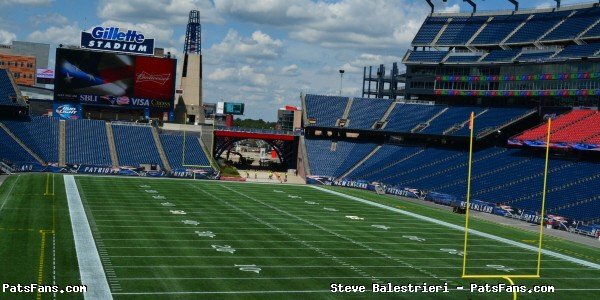 This entry was posted in 2017 Patriots Season, NFL Commentary, Patriots Commentary, Patriots News and tagged 2017 Patriots Season, Austin Serferian-Jenkins, Bill Belichick, Chris Hogan, Danny Amendola, Dion Lewis, Dont'a Hightower, Josh McCown, Josh McDaniels, New England Patriots, New York Jets, NFL, Rob Gronkowski, Tom Brady, Trey Flowers on October 15, 2017 by Steve Balestrieri.